STOCKHOLM — All of the Swedes had points and a Canadian stayed hot to help the Ottawa Senators get a 4-3 overtime win against the Colorado Avalanche in front of a sellout crowd of 13,396 in the first game of the 2017 SAP NHL Global Series at Ericsson Globe on Friday. Senators forward Mark Stone, who is from Winnipeg, scored his second goal of the game and eighth in the past eight games 59 seconds into overtime on a one-timer from the left circle. Karlsson, who is from Landsbro, Sweden, had two assists, including on Stone’s winner. Ottawa defenseman and Stockholm native Fredrik Claesson scored for his first point of the season. Johnny Oduya, also from Stockholm, had an assist. Avalanche captain Gabriel Landeskog, who is from Stockholm and was Colorado’s only Swedish player in the game, had an assist. “This was an all Swedish night,” Ottawa coach Guy Boucher said. 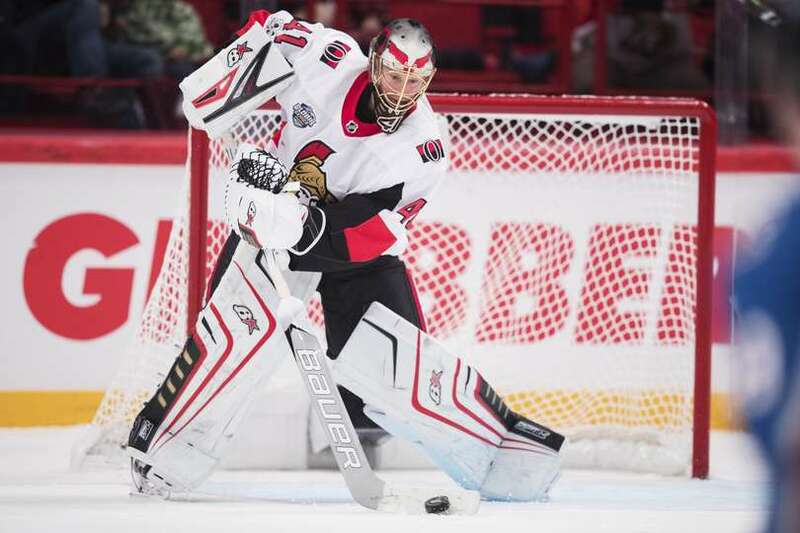 The Senators also got a goal from Chris DiDomenico and Craig Anderson made 16 saves. Nathan MacKinnon, Alexander Kerfoot and Nail Yakupov scored for Colorado, and Semyon Varlamov made 28 saves. Matt Duchene, who was traded from the Avalanche to the Senators on Sunday, made his Ottawa debut. The forward had two shots on goal and was minus-1 in 16:44 of ice time. The Senators (7-3-5) and Avalanche (8-6-1) play again at Ericsson Globe on Saturday (1 p.m. ET; NHLN, SN, RDS, ALT, NHL.TV). MacKinnon tied the game 3-3 at 12:53 of the third period with his fifth goal of the season. He has 10 points (four goals, six assists) in his past five games. Boucher said he liked the way the Senators responded after the goal to ensure the game got to overtime. They had three shots on goal on eight shot attempts in the final 7:07. The Avalanche had one shot on four attempts. The Senators held the Avalanche to eight shots on goal in the second and third periods after Colorado outshot them 11-9 in the first period. Kerfoot tied it 2-2 with a deflection goal at 9:41 of the second period, but DiDomenico scored 3:40 later to give Ottawa a 3-2 lead. Avalanche forward Matt Nieto had a chance to tie it, but couldn’t score on a penalty shot after getting slashed by Senators defenseman Chris Wideman on a shorthanded breakaway at 18:33 of the second period. Stone scored his first goal off a deflection of Oduya’s shot at 15:10 for a 2-1 lead. Claesson beat Varlamov on the glove side with a slap shot from the top of the left circle 20 seconds after Yakupov gave Colorado a 1-0 lead with a power-play goal. Stone’s winner 59 seconds into overtime. Anderson’s glove save on Nieto’s penalty shot at 18:33 of the second period. Claesson’s goal and celebration at 8:36 of the first period. Avalanche defenseman Samuel Girard had an assist and played 21:55 in his first game since being acquired in the trade that sent Duchene to the Senators.